DA NANG (VNS) — Five records were broken on the closing day of the National Short-Course Swimming and Fins-swimming Championships in Da Nang yesterday. HCM City dominated the field, collecting 25 gold, 14 silver and eight bronze medals over the five days. Their showing demonstrated a depth of talent. Long An's side came in second in the rankings with a tally of six gold, five silver and 10 bronze medals. Quang Ninh came in third, bagging three gold, three silver and one bronze medal. Swimmer Tran Duy Khoi brought home an additional three golds yesterday – one for a team and two for individual events. The three wins added to his impressive five-day collection bringing his total to a record 11 gold medals. Over the course of the competition, Khoi broke four national records. Khoi, 18, clocked 1min 58.64sec in the men's 200m backstroke, shaving a just over a whopping 58sec off the previous record set by Hanoian Do Huy Long in 2008. 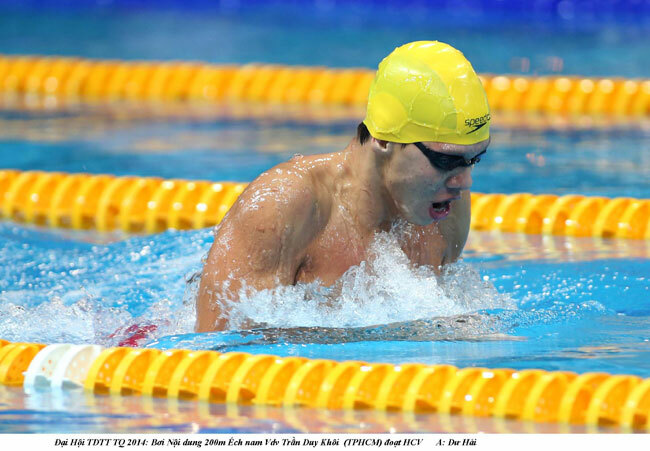 The men's 220m backstroke event was a stunning display of speed with all three medalists – Tran Van Trieu and Nguyen Ngoc Trien from Hai Phong – breaking the previous national record. Pham Thanh Nguyen of Long An broke the men's 1,500m freestyle record, which he set last year, with this year's time of 15:32:29. The men and women's relay teams from HCM City both set new records in the 400m and 200m medley. The women's team clocked 2:00:02, 32 hundredths of a second faster the previous record, a record they also set.